A senior separatist and four others are killed after police fire on Muslims near the border in Indian-administered Kashmir. How will the new bus service affect the peace process? 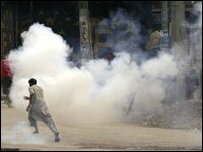 Victoria Schofield, author of Kashmir in Conflict, explains how the dispute began. Pakistan-based group fighting against Indian control.